Every click on http://www.uniqueairexpress.com/default.aspx will generate 0.5 $ to Snehalaya without donating money. Unique Air Express, one of the largest international courier company in India, has taken the initiative to support a noble cause. We are very thankful to you & Unique Air Express for making the difference in the lives of deprived women & children. 28th October- Snehalaya will be honored with the prestigious "Dr.Durgabai Deshmukh National Award " by Hon.Shri. Pranab Mukharje, President of India, for its outstanding and innovative contribution to women's welfare and empowerment since last 2 decades. The Central Social Welfare Board gives this annaul award in the memory of great visionary and pioneer of women's progress, late. Dr. Durgabai Deshmukh. Dr. Durgabai Deshmukh was a courageous freedom-fighter, committed educationist, active social reformer and an eminent Parliamentarian. She was a member of the Constituent Assembly of India and the Planning Commission of India. She was also the founder chairperson of the central Social Welfare Board in the first years of its existence from 1953-62. She contributed greatly to developing the Board as a body which could link the governmental sectors in the effort to ameliorate the status of women and children in the country. The Award shall carry an amount of Rs. 5 lakhs, a citation and a shawl. The award ceremony will be held at Darbar Hall of Rashtrapati Bhavan, New Delhi on this November 5th 2012. 24th October- Priyanka, a 2-year-old girl child returned to her family after 1 year due to continuous hard efforts of 'Team Snehankur.' As the hours turned into days, then weeks, then months, it became harder and harder to believe that she would ever be found in safe condition. "Thanks to team Snehankur & Snehalaya!" Mrs.Vaishali and Mr. Subhash Gilbile said at an emotional informal function at Snehankur on yesterday. Priyanka is the 6th daughter of Mr. & Mrs. Gilbile. They live at Rastapur villege of Newase Tehsil in Ahmednagar District. Mrs. Vaishali left Priyanka to her mother in Mohori Village in Pathardi Tehsil in October 2012. It was last 1 year ago in Navratra that 2-year-old Priyanka was lost near Mohata Devi Temple in a huge crowd. She was with her grandmother who came for darshan at Mohata Devi. Police Patil of village Mohata Devi informed Snehankur that 1-year-old Priyanka was found in the temple. Team Snehankur immediately took the custody of Priyanka then gave news of her missing in all leading newspapers, radio and TV channels to search her relatives. Also her photo and information was given to all Gram Panchayats and police stations but unfortunately Snehankur received no response about her family. The family of Gilbile is illiterate & poor. They came to know about Priyanka's missing status after 8 months when they reached directly to the grandmother's house. The grandmother of Priyanka was afraid of telling about Priyanka's absconding from her custody. They started to search for Priyanka in all nearby villages but no one guided them properly. Lastly, Police Inspector. of Pathardi Police Station directed them to go to Snehalaya's Snehankur Centre for help. Snehankur not only returned Priyanka to her family but also assured for her educational support due to their poor economic background. 25 October- An orchestra felicitated Sadashiv Tajane, the trustee of Maharogi Seva Samiti and Manager of 'Swaranandwan,' today for his ever-great contribution to Anandwan. SWARANANDAWAN, a "therapeutic orchestra" of 130 physically-challenged residents of Anandwan which was founded by the late Baba Amate. 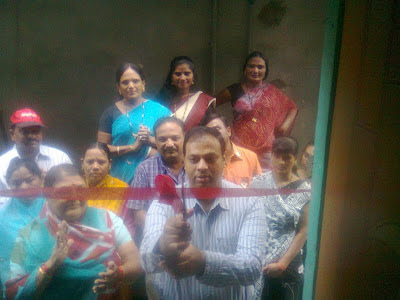 The function was organized by all NGOs in Ahmednagar. All the 130 musicians were present at the occasion. Mr. Tajane shared his experiences with the late Sadhanatai and Mahamanav Baba Amte. Mr. Tajane, a 60-year-old young man, utilizes a wheelchair but still leads the team of 130 persons. Swaranandwan has successfully raised the good amount of funds for Anandwan by presenting 1530 shows at all corners of India. Shubhyan Motors & Tata Motors jointly organized a Drawing Competition for children of Snehalaya's English Medium School on National Customer Care Day which was celebrated on 23rd Oct, 2012. Tata Motors has launched their first commercial vehicle truck on October 23rd, 1954. Sunil Thapa, student of Snehalaya's School receiving his 1st prize in Drawing Competition by the hand of Mr.Dinesh Chandra Renwal, Manager- Customer Support, Tata. Snehalaya’s children recently performed various cultural programmes in village of Loknayak Anna Hajare’s Ralegansiddhi, Ahmednagar. The occasion was traditional Padmavati Navratra Mahotsav of the village. 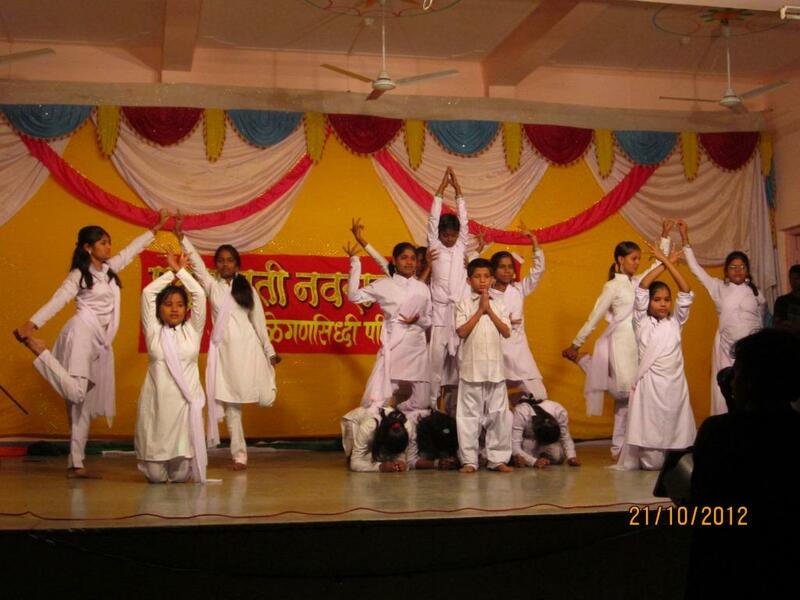 In this utsav, various programmes were organized and prizes were distributed. 53 of Snehalaya’s children had taken part in cultural programmes and over 1000 people were present for the cultural show. Children had highly enjoyed this occasion. Snehalaya has been nominated for “Nishkam Karmyogi Purskar” awarded by District Varkari Seva Sangh for constant and concrete work in red light area and with women in the flesh trade and their children. The award will be given on 1st Nov. 2012 by Prof. Dr. Vishvnath Karad (founder of Vishvshanti Kendra and Senior educationalist).